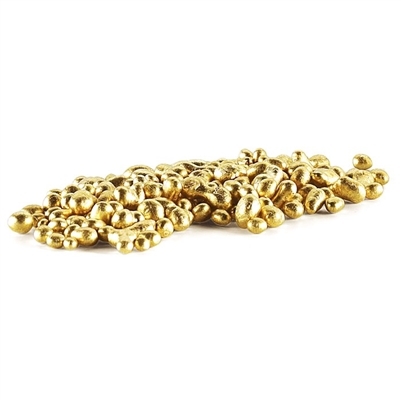 200 Bright Yellow Casting Alloy 14K - 1 oz. 200 Bright Yellow Casting Alloy 14K - 1 oz. (28 grams). Mix Alloy # 200 with fine gold to obtain 14K Bright Yellow Gold for casting. Melt temperature for 14K Alloyed Grain: 950°-970°C, 1475°-1780°F. Pre-graining is recommended for all alloy and fine gold before casting to assure a uniform mixture. Boracic Acid is the recommended flux. Use as little flux as possible. Do not use carbon fluxes or any fluxes designed for refining; i.e. soda ash, saltpeter, etc. Avoid flux in bottom pour automatic casting units. Most standard investment removers will successfully remove the investment powder. Flouric-based investment removers are the best for removing the silicon oxide in invisible coating. 35-50% fresh mix for re-melting is recommended, unless #99 Alloy Replenisher is used. Melt temperature may vary with type of unit.